Boston Bruins' David Krejci battles for the puck with Los Angeles Kings' Dion Phaneuf during the third period of an NHL hockey game Saturday in Boston. BOSTON — The Boston Bruins honored Patrice Bergeron before the game. He made sure there was a celebration at the end. 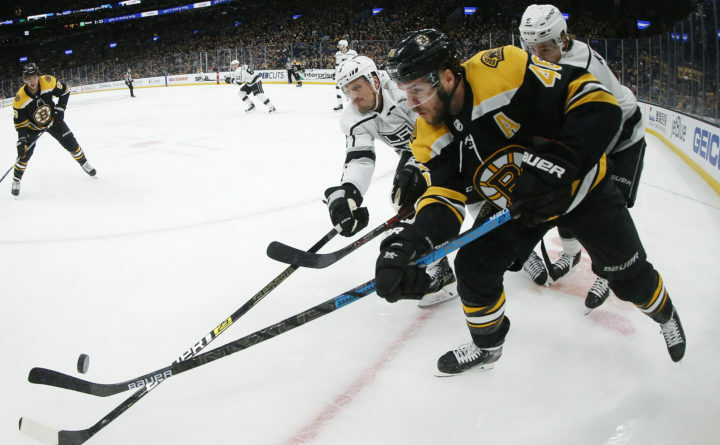 Bergeron scored a power-play goal with 2:26 left in overtime, and the Bruins beat the Los Angeles Kings 5-4 Saturday after blowing a two-goal lead. The Bruins held a pregame ceremony for Bergeron, who earlier this week became the fifth player in team history to play 1,000 games with the club. During the first period, there was a video tribute that included congratulations from Super Bowl MVP Julian Edelman and former Red Sox star David Ortiz. He had set up two other goals before beating goalie Jonathan Quick with a wrister from the right circle for the game-winner. Charlie McAvoy had the other goal and Tuukka Rask stopped 25 shots for Boston, including Adrian Kempe’s breakaway in the first minute of OT. The Bruins have collected at least a point in eight of their last 10 games (4-2-4). Krejci gave the Bruins a 3-2 lead just 90 seconds after Heinen tied it early in the third. Skating in on rush, Torey Krug fired a shot off the right post before Krejci sent the rebound into the net. The Bruins then took their two-goal lead when Marchand converted a perfect pass from Bergeron for a short-handed goal at the end of a 2-on-1 break. Trailing 1-0 midway into the second period, the Kings scored twice in just under six minutes to move ahead. With Krejci in the penalty box for slashing, they tied it on Iafallo’s power-play goal at 8:13, a shot from the right point that caromed in off Rask. Kopitar made it 2-1 when he one-timed a pass from Dustin Brown from the bottom of the right circle at 14:02. “We worked hard to get the 2-1 lead and we kind of feel asleep there,” Los Angeles forward Brendan Leipsic said. The Bruins had moved ahead 1-0 when Bergeron set up McAvoy’s goal 4:38 into the second. Bergeron collected a pass down low, twisted his hands quickly and made an off-balance feed to McAvoy, who was coming hard down the middle toward the net. Quick made a couple of nice stops late in the scoreless first. The best was when he came across the crease to block Peter Cehlarik’s shot from the bottom of the right circle. Bergeron reached the 1,000-game milestone in a 3-1 win over the New York Islanders on Tuesday, scoring two goals. … The others to play that many with the Bruins are Hall of Famers Ray Bourque and John Bucyk, current GM Don Sweeney and Wayne Cashman. … Los Angeles played the fifth of a six-game trip; it was Boston’s first of three straight at home before it heads west for a five-game trip. … The teams meet again in Los Angeles on Feb. 16. … Bruins D Matt Grzelcyk was out with a lower-body injury. … Los Angeles C Jeff Carter missed his third straight with a lower-body injury. It was the opener of a Los Angeles-Boston doubleheader in TD Garden. The Celtics were set to host the Clippers Saturday night. Loud chants of “Beat LA!” echoed around the building after Boston tied it in the third. Kings: At the Capitals on Monday night. Bruins: Host the Avalanche on Sunday.